The Federation of State Medical Boards and National Board of Medical Examiners have developed a three-step examination process for licensing doctors. This system is known as the United States Medical Licensing Examination. The three steps that make up the USMLE cover all of the knowledge and skills required to identify medical conditions and maintain patient health. Step 1 of the USMLE focuses on the application of scientific concepts to the field of medicine. In particular, USMLE Step 1 covers the conceptual underpinnings of health, disease, and therapeutic techniques. The content areas covered in Step 1 of the USMLE are as follows: anatomy; behavioral sciences; biochemistry; microbiology; pathology; pharmacology; physiology; and miscellaneous interdisciplinary topics, such as nutrition, aging, and genetics. The questions on this examination will require the candidate to interpret material from graphs and tables; to identify gross and microscopic pathologic and normal specimens; and to apply basic science knowledge to clinical problems. The content of the USMLE Step 1 exam can be broken down either by body system or by process. When broken down by system, 40 to 50% of the exam is on general principles, while 50 to 60% of the exam is on individual organ systems (hematopoietic/lymphoreticular; nervous/special senses; skin/connective tissue; musculoskeletal; respiratory; cardiovascular; gastrointestinal; renal/urinary; reproductive; and endocrine). When broken down by physical process, the exam is as follows: normal structure and function (30-50% of the exam); abnormal processes (30-50%); principles of therapeutics (15-25%); and psychosocial, cultural, occupational, and environmental considerations (10-20%). Individuals who pass Step 1 of the USMLE will not only have a solid understanding of the scientific foundations of medicine, but will be able to maintain their competence as scientific advances lead to changes in therapeutic practice. This site has no affiliation with the USMLE and is not endorsed by the USMLE. 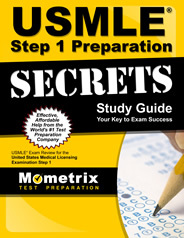 Ace the USMLE test using our USMLE exam study guide with practice questions. 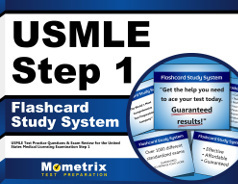 Quickly Solve Difficult USMLE Test Questions with the USMLE Flashcard Study System.